While many are worried about Robert Downey Jr.’s contract negotiations to return as Tony Stark, there is another integral piece of the Marvel Studios machine that will need to renegotiate in the coming years. Speaking with Collider, Marvel Studios President Kevin Feige says his contract will eventually expire, but that he will remain with the company for some time. 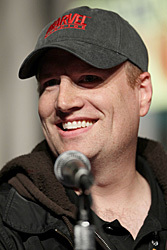 In our exclusive interview with Feige, he spoke about their plans for Phase 3 and beyond. You can read that by clicking here.